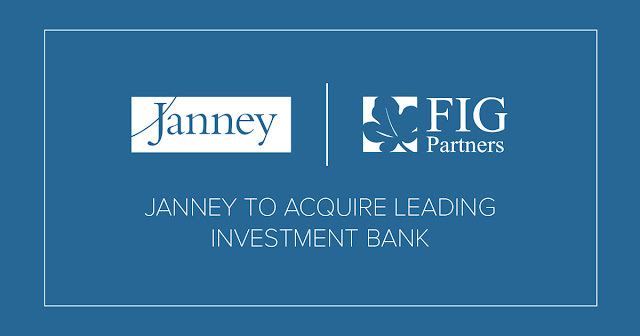 PHILADELPHIA – March 19, 2019 – Janney Montgomery Scott LLC, a leading full-service wealth management, capital markets, and asset management firm, announced today that it has agreed to acquire FIG Partners LLC, an Atlanta-based investment banking and research firm. The experienced team at FIG Partners brings nationally recognized expertise within the community bank sector to Janney’s existing financial institutions sector coverage. The transaction, expected to close in the second quarter, is Janney’s second investment bank acquisition in less than 12 months, following the addition of HighBank Advisors in May 2018. This addition gives Janney a total of more than 200 capital markets professionals, who provide investment banking, equity, and fixed income expertise to corporate, institutional, and municipal clients. Janney has consistently ranked as one of the top middle-market capital markets firms in the U.S. Since 2013, the firm has completed 420 investment banking transactions aggregating $50 billion in value. FIG Partners currently covers 125 small and mid-size banks and makes markets in 800-plus community bank stocks. Highlights include 43 M&A transactions, totaling approximately $4.6 billion in transaction value, $1.1 billion of equity capital raised, and more than $185 million of debt capital raised since 2017. Freeman & Co. LLC acted as financial advisor to Janney. Blank Rome LLP served as legal counsel to Janney. Silver, Freedman, Taff & Tiernan LLP served as legal counsel to FIG Partners. Janney provides advice to individual, corporate, and institutional clients. Our expertise includes guidance about asset management, corporate and public finance, equity and fixed income investing, equity research, institutional equity and fixed income sales and trading, investment strategy, financial planning, mergers and acquisitions, public and private capital raising, portfolio management, retirement and income planning, and wealth management. Janney is an independently operated subsidiary of The Penn Mutual Life Insurance Company and is a member of the Financial Industry Regulatory Authority, New York Stock Exchange, and Securities Investor Protection Corporation. Additional company information is available at www.janney.com. FIG Partners is one of the nation’s premier investment banking and research firms specializing in community banks. Headquartered in Atlanta, Georgia, FIG Partners has offices in California, Florida, Illinois, New Jersey, North Carolina, and Tennessee. For more information visit www.figpartners.com.